Passengers are welcome to board our ship at 6:00 p.m. After comfortably settling into your cabins, we’ll introduce our crew at a welcome cocktail before dinner and an evening of onboard entertainment. 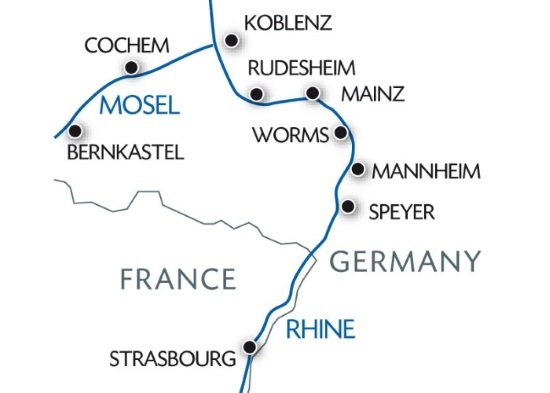 The whole day will be spent cruising along the Rhine towards Cochem, nicknamed the pearl of the Moselle region. The morning will be spent cruising towards Bernkastel, we’ll discover of a multitude of small, legendary villages with their vines and castles. Take advantage of some free to visit and stroll through the picturesque streets of the city. Tonight is our gala evening and dinner. We’ll cruise through the Moselle river Valley to Koblenz. We’ll discover the historic city center in the company of our hostess. We’ll cruise along the romantic Rhine, its numerous castles nestled among the famous vineyards, and its legendary Lorelei rock. In Rüdesheim, join us on a tour of the Museum of Mechanical Musical Instruments. We’ll return on board to celebrate New Year's Eve. The morning will be spent cruising to Speyer or Mannheim. We’ll discover the town with our hostess. Celebrate the New year on the romantic Rhine and Moselle and discover Bernkastel, a beautiful town in the heart of the Moselle Valley, but also Koblenz, which is today a small yet dynamic German city with many stories to tell.